Sherrel Sampson is the Founder and CEO of Canviiy. Prior to founding Canviiy, Sherrel led teams as a strategic marketer, developing marketing solutions for Fortune 500 companies for nearly a decade. Leveraging her beauty experience and her passion to develop an effective scalp-soothing solution, Sherrel researched and crafted a one-of-a-kind formula to stop an itchy scalp. 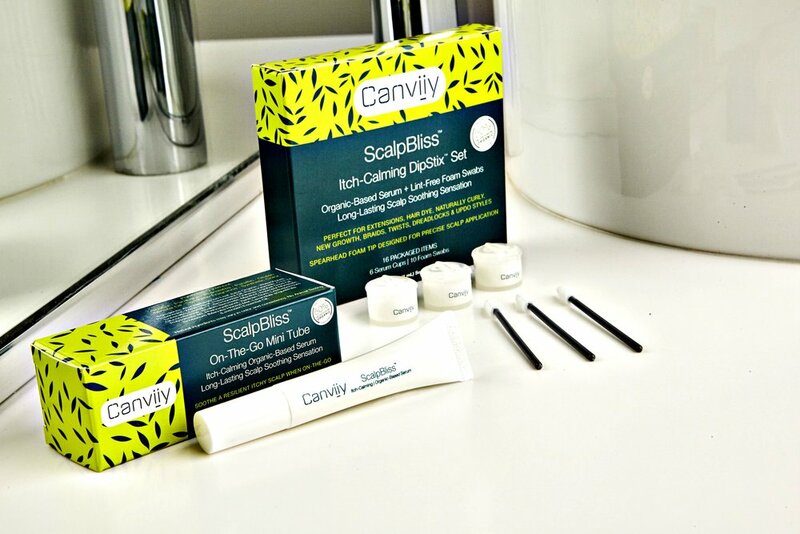 With a team of organic experts in tow, Sherrel launched Canviiy -- featuring the ScalpBliss™ Collection which introduced the world’s first and only Organic Long-Lasting Itch-Calming Scalp Set trademarked as the ScalpBliss DipStix® Set. When did you first learn that you had to fill a void in hair care? I recognized a significant void in the hair care industry when I experienced a persistent itchy scalp and couldn’t find an adequate solution. I researched many anti-itch products and brands to find that many were based in harsh ingredients, and contained petroleum and mineral oil that clog the scalp. After trying several products that provided very little relief, I was inspired to formulate botanical-based scalp care products that calm scalp itch for an extended period of time. Our ScalpBliss products feature a proprietary, high-performance itch-calming serum, infused with natural and certified organic ingredients such as aloe vera and lavender that ultimately soothe and nourish the scalp. By far, the most fulfilling moment was the day Canviiy was launched. The moment our website went live, I realized all the long nights and personal sacrifices were completely worth it. To begin with a vision, launch your dream company and hear positive customer experiences is quite humbling on many levels. What are your beauty projections for this season? There’s a growing trend within the beauty and hair care industry in which shoppers are switching to brands that develop products based on their specific needs with a focus on natural ingredients and superior performance. I see a trajectory of independent beauty brands resonating with consumers based on their customization of benefits and overall filling a niche across markets. You've been #Indiqued! Tell us about your experience working with our brand? First, I would like to share that it’s the people behind Indique that makes the brand truly special. After interacting with Indique’s team, I was able to better understand how they deliver a 360 premium customer experience. I can’t say enough about Indique’s impeccable quality and luxurious products. I used to be a believer that ‘all hair is the same,’ but Indique’s products surely changed my perspective. What advice do you have for someone aspiring in your field? In order to achieve something great, you must be willing to take risks and embrace challenges. When you step into the realm of fear, just know that you are on the verge of greatness and your next chapter will encompass new exciting opportunities for you to conquer. What have been some of the barriers you've faced in this industry? Overall, I’ve had a phenomenal experience in the beauty space. Yet, gaining market credibility for Canviiy will continue to be a barrier. Being a new emerging brand, that’s an anticipated barrier and one we intend to overcome with time. What is a staple beauty/hair item that we should all have? You must have the ScalpBliss On-the-Go Mini Tube in your clutch at all times. Our customers experience a long-lasting itch-free feeling that can last from hours to days. Additional benefits include the serum’s lightweight, non-runny, non-greasy texture along with precise applicators which are designed for easy use. Never get caught scratching and patting your weave!